Bio-Degreaser is a powerful water based degreaser cleaner concentrate. This is a commercial and industrial strength cleaner degreaser that is ideal for removing oil and fat from a variety of hard surfaces. This strong degreaser cleaner can be used to clean food surfaces and floors in commercial kitchens. In motels Bio-Degreaser will clean showers and ovens as well as the exterior of the buildings. 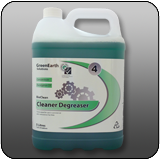 You can also use the degreaser to clean car engines and upholstery and it will remove oil stains from concrete. 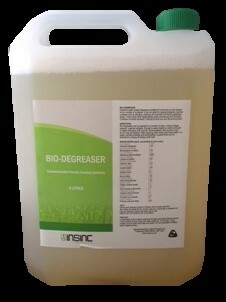 Bio-Degreaser contains no harsh solvents and is friendly to both the user and the environment. 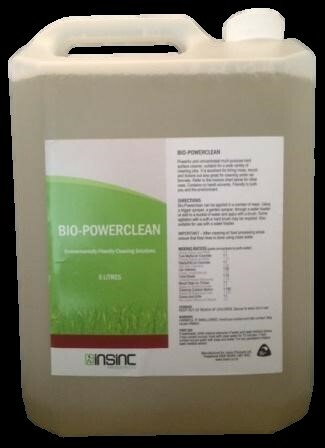 As a concentrated cleaning chemical Bio-Degreaser can be diluted up to 300 parts water to 1 part chemical (for stainless steel surfaces) giving excellent value for money. Buy on-line today. Detergent based cleaner. Good for washing wooden houses and green spouting. Won't hurt plants.